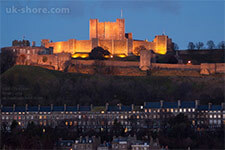 Dover is brimming with things to do and see. 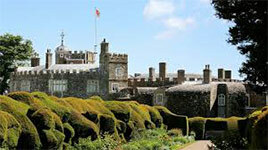 It has a unique place in history and you could spend weeks exploring castles, museums and beautiful gardens. 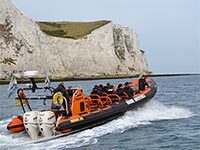 There can be no doubt that The White Cliffs of Dover are one of this country's most spectacular natural features. They are an official icon of Britain and have been a symbol of hope and freedom for centuries. 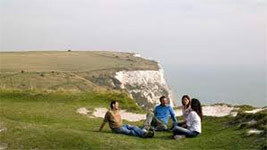 Enjoy exhilarating cliff top walks, which offer unrivalled views of the busy English Channel. 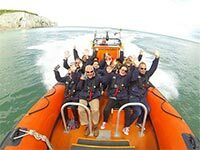 Learn more about their fascinating military history, or just watch the ships passing in the Channel, visiting cruise ships and the development of the Port of Dover from the comfort the coffee shop in the visitor centre on Langdon Cliffs. Some of these attractions operate restricted opening times and dates - please check with the attraction before making your visit. 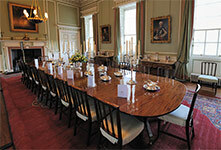 Follow the famous... Noel Coward, Churchill, Caesar, Wellington and Nelson. Perched high on the Famous White Cliffs of Dover the Castle is the "Key of England" and has 2000 years of history within its walls. See the field hospital in the Secret Wartime Tunnels Complex. At Dover Castle, Churchill masterminded W.W.II strategy here. The secret tunnels set alongside Roman Walls remind us of the long history of this most famous of castles, where you can almost imagine the ghosts of invading armies. 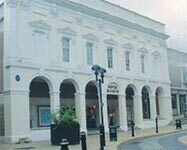 Dover Museum is much more than just a Local History and Archaeology Museum. Situated in the town centre of Dover Historic Port, this modern museum tells the fascinating story of this rich and important area. 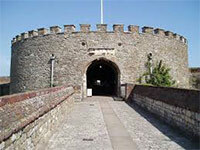 Dover Museum is one of the oldest museums in Kent, founded over 150 years ago in 1836. 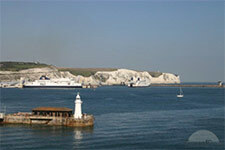 Because of its position, Dover controls the English Channel and is known as the 'Lock and Key of England'. 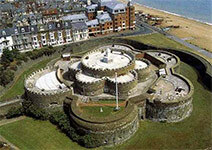 Julius Caesar tried to land at Dover during the Roman Invasion of 55 BC and it was the prime objective of the invasion plans of William the Conqueror, Napoleon and Hitler. 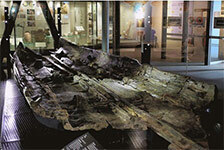 The wooden prehistoric boat, discovered in September 1992, is thought to be some 3,000 years old. 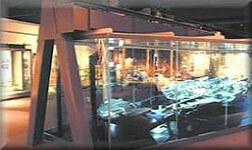 The Dover Museum is privileged to host its famous Bronze Age Boat in the acclaimed Gallery. The Battle of Britain Memorial at Capel-le-Ferne, on the famous white cliffs between Dover and Folkestone, occupies a special place in the hearts and minds of all those who have visited this moving site. While the Memorial can be accessed on foot, free of charge, at any time, the car park and the new Wing building, which includes The Scramble Experience, The Cockpit Cafe and the Shop, is open as per the times below. There is a small charge to park and an admission charge for The Scramble Experience itself. 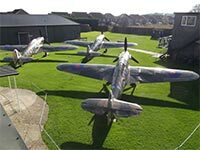 Maintained by the Battle of Britain Memorial Trust, the site at Capel-le-Ferne is dedicated to Churchill's famous "Few" who fought to keep this country free from invasion in 1940. The Memorial itself inspires quiet reflection on the bravery and sacrifice shown by the aircrew - fewer than 3,000 men - who took part in probably the most crucial battle fought by this country in the whole of the 20th century. The Christopher Foxley-Norris Memorial Wall lists the names of the aircrew involved, while the new Scramble Experience uses high-tech wizardry to bring the Battle to life. 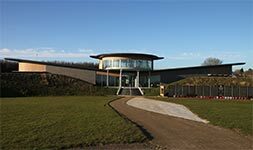 A retail area and a first floor cafe with stunning views over the Channel towards France completes a fantastic resource which has added an impressive new dimension to the Memorial site. Location: from Dover or Folkestone on the B2011 at Capel-le-Ferne. The postcode is CT18 7JJ. The Highlight of the White Cliffs. 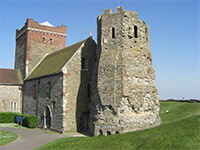 This distinctive landmark is perched high up on the White Cliffs overlooking the Straits of Dover. 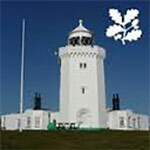 Built in1843 the lighthouse was used by Marconi just over 100 years ago for early radio experiments. From here he made the world's first ship to shore, and subsequently the first international radio transmission to Wimereux in France. Learn about the history of the tower and the people associated with it in a tour that takes about 30 minutes. 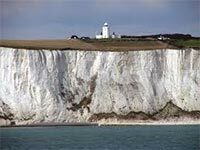 Combine your visit with the Gateway to the White Cliffs nearby and learn about what is special and the significance of the cliffs in a relaxing coffee shop atmosphere. 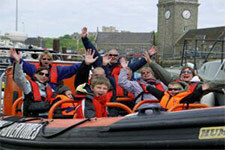 To help you decide, and for full details, visit the website: www.doverseasafari.co.uk. Open the door to this charming Tudor Castle by the sea. Explore eight acres of magnificent gardens, woodland, and sea views, now home to the Lord Warden. Come and see the original Wellington Boots in this 200th anniversary year of Waterloo. It is time to take a fresh look at the castle and see new displays, hear previously untold stories, and discover a new side to its famous residents. Come and explore the re-imagined Walmer, covering Wellington's career, life story and the iconic 'celebrity' status he attained during and after his lifetime. The displays have been freshly created to mark the 200th anniversary of the Battle of Waterloo. Prime Minister, William Pitt the Younger, lived here at the time he was organizing opposition to Napoleon Bonaparte. Find out how he orchestrated England's defences against invasion, in the new displays. This year is the perfect time to take a new look at Walmer. Explore the castle with its new multimedia guide, and hear previously untold stories of the castle and its residents. These high chalk cliffs look out onto the English Channel, giving far-reaching views towards the French coast. 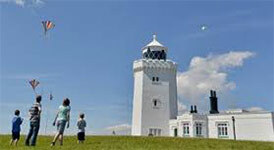 The best way to see the cliffs is to take a walk along the coastal path towards South Foreland Lighthouse. You’ll get a great view of the cliff’s and also see the chalk grassland that's home to so many unusual plants and insects like the chalk hill blue butterfly and the pyramidal orchid. The cliffs also have a special place in our national history and they were used for defence in both World Wars. You can see reminders of this past at the newly opened Fan Bay Deep Shelter a complex of Second World War tunnels hidden within the chalk. The cliff reaches up to 110 meters (350 ft) and owes its striking façade to its composition of chalk accentuated by streaks of black flint. Built by the order of King Henry VIII it is one of the finest Tudor Artillery Castles in England, and among one of the earliest and most elaborate of a chain of Coastal Forts. Today you can explore the whole of the Castle, from the storerooms to the first-floor captain’s residence. 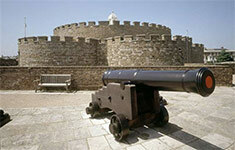 Take a walk around the defences and admire the squat, rounded Bastions and Canons. 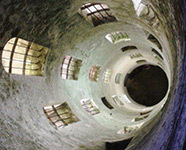 It is a fascinating Castle to explore, with Long Dark Passages, Battlements and a Massive Basement with an exciting Exhibition. Its remarkable coastal position affords breathtaking views out to sea. 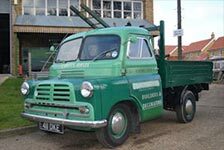 Dover Transport Museum, the only museum of its kind in Kent, is home to many forms of vintage transport and shop fronts displaying the kind of items that would have been familiar to young visitors' grandparents and great grandparents. 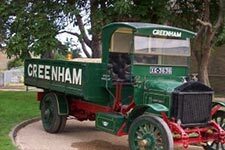 With a large visitor operated model railway and a taxi and bus hunt for children, a visit to the museum makes a memorable family day out. 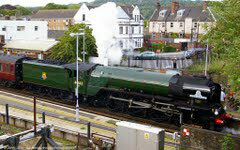 The East Kent Railway is an exciting up and coming heritage railway deep in the Kent Countryside. 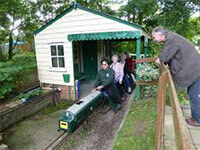 It was originally built to serve the Kent Collieries and today is run entirely by volunteers. 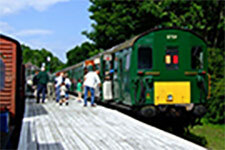 Today, visitors can ride lovingly restored Heritage Trains between the small leafy village of Shepherdswell and the idyllic village of Eythorne, near Dover in Kent, a distance of just over two miles. The railway runs most Sundays throughout the year, with the exception of winter months, when a limited service may be in operation. Please check the timetable for further details or visit our timetable and events pages for details of all train times and events throughout the year. The Roman Painted House, the finest Roman House on show in Britain, was discovered by Kent Archaeological Rescue Unit. 25 years of excavation across ancient Dover by the Unit have uncovered 50 Major Structures. The Painted House was the best preserved and is now a major Tourist Attraction. Built about AD.200 it formed part of a large Mansion or Official Hotel, for travellers crossing the Channel. It stood outside the great naval fort of the Classis Britannica, but in AD. 270 it was demolished by the Roman Army during the construction of a larger fort. 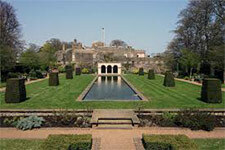 Three of its main rooms were then buried substantially intact under its ramparts. Burial by the Army resulted in the unique survival of over 400 sq. ft. of painted plaster, the most extensive ever found north of the Alps. Above a lower dado, of red or green, visitors can still see an architectural scheme of many coloured panels framed by fluted columns. The columns sit on projecting bases above a stage, producing a clear 3-D effect. Parts of 26 panels survive, each with a motif relating to Bacchus, the Roman God of wine. An exceptionally well preserved Roman Painted House, with extensive intact wall paintings and elaborate under-floor heating. Located adjacent to the White Cliffs Experience. 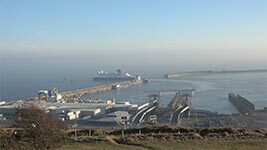 Samphire Hoe is a new piece of land created by Eurotunnel during the construction of the Channel Tunnel. 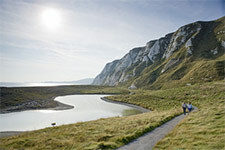 The chalk cliffs at Dover form a vital element of the Kent Downs Area of Outstanding Natural Beauty, a Nationally important and Protected Landscape. Samphire Hoe is one of the few places where one can truly appreciate the drama of the White Cliffs. Great care has been taken to make the landscape of Samphire Hoe fit into this dramatic setting. 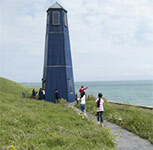 Samphire Hoe covers a 30-hectare site at the foot of the famous Shakespeare Cliff, Dover Kent. In July 2015, Samphire Hoe has received for the 10th year running the Green Flag Award recognising that the Hoe has achieved the national standard for Parks and Green Space in England and Wales. 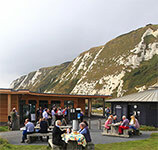 Samphire Hoe Country Park is a country park situated 3 km west of Dover in Kent in southeast England. 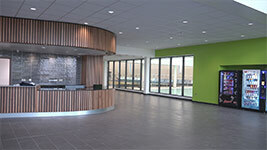 Dover District Leisure Centre is a multi-sports leisure centre with swimming pools, sports hall, squash courts, a 120 piece gym, 3 studios, a sauna and steam room, and clip 'n climb walls. 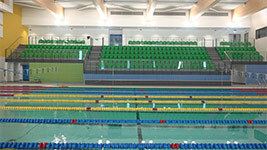 There are a range of membership packages available, however, you do not have to be a member to use the centre. Our experienced health and fitness team will work with you to devise a personalised and varied exercise programme to give you the advice and support you need to get the most from your workout. Owned, operated and maintained by Crabble Corn Mill Trust, the Mill was rescued from demolition and opened to the public in 1990. 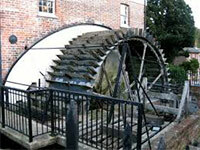 It can now boast to be one of the most complete and working examples of a Georgian Watermill in Europe. 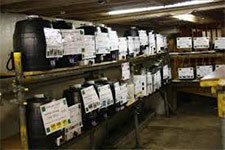 All the staff at Crabble Corn Mill are volunteers and take no wages; we do this simply to keep the Mill going. Our only income is from visitors and occasional donations. Crabble Corn Mill receives no financial aid from the state and all monies raised go to the upkeep of Mill and its estate. 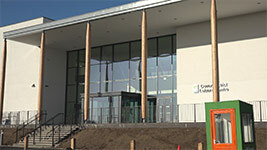 The current structure was built in 1812 alongside an existing Mill which was later demolished to allow for additional storage space - what is now the exhibition area on the ground floor and the Tea Rooms. However, records show that there has been a mill on this site since at least 1227 when Henry III granted a Charter of Confirmation to St. Radigund's Abbey, the ruins of which can still be seen today on the hill above the village. 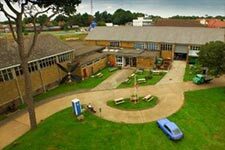 The Museum gives a fascinating insight into the life for women serving their country during the Second World War. 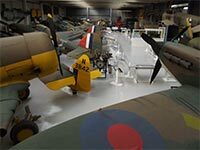 The largest and most important collection of Battle of Britain artefacts on show in the World. 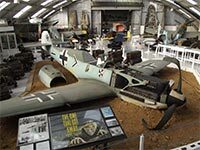 Aircraft, vehicles, weapons, flying equipment, fine art prints and relics recovered from over 700 Battle of Britain aircraft crash-sites. 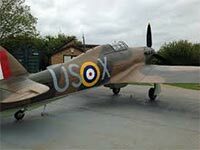 It also features a well stocked shop including books, DVDs, CDs, diecast models and aviation related goods. In 2015 we opened the No.25 Squadron Mess and Tea room on site. A series of forts, strong points and ditches that formed the largest Napoleonic fortification in Britain. 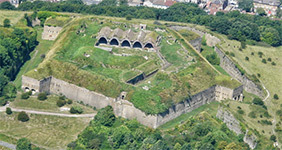 Structures include the Citadel, the Drop Redoubt, the Detached Bastion and the North Entrance as well as many other important features designed to help fight off a French invasion by Napoleon. 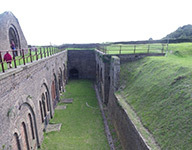 The site was first developed in 1779 and properly fortified in 1804 by Lieutenant-Colonel William Twiss, who also drew up plans for the Grand Shaft, a triple spiral staircase, to assist with the movement of troops between the fort and the town below. The area is now a Local Nature Reserve, is protected within the Kent Downs Area of Outstanding Natural Beauty, and is a Scheduled Ancient Monument. The Western Heights Local Nature Reserve can be visited at any time. Visit the website to see opening times for The Grand Shaft. 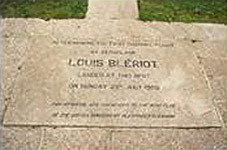 Visit the site where Louis Blériot landed after becoming the first person to fly across the English Channel. 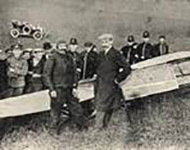 Louis Blériot flew across the English Channel on 25 July 1909 from France to Dover. Born in 1872, Blériot was a French aviator, inventor and engineer. He became world famous for making the first flight across the English Channel in a heavier than air aircraft, winning a prize of £1,000. Blériot was also the first to make a working, powered, piloted monoplane and was founder of a successful aircraft manufacturing company. 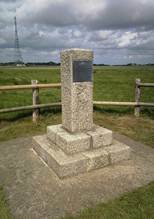 This site marks the spot where Blériot landed his plane after completing his flight. 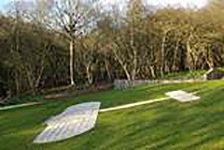 The memorial can be found in a clearing in the wooded area behind Dover Castle, and consists of granite blocks in the shape of Blériot's plane - click here to find it's location on a map. The Royal Flying Corps flew from here to Amiens between 13 and 15 August 1914 as part of the 1914 British Expeditionary Force. The Royal Flying Corps was formed under a Royal Warrant of 13th April 1912, almost three years after Blériot's historic flight. When the Royal Flying Corps prepared to fly to France in August 1914, it assembled four squadrons (2, 3, 4 and 5) each with 12 aircraft. There were also spare aircraft to be flown to France to establish depots. All these machines assembled in a field at the top of the cliffs, just to the north of the present Eastern Docks complex. The field was later to become part of the RAF Swingate site but in 1914, it was just a flat field, close to the cliffs. Today the gate into the field from the clifftop road between Dover and St. Margaret's at Cliffe has a small granite pillar with a plaque attached. Click here to find the memorial on Google Maps. You will find many things to encourage you to "Stay a While"